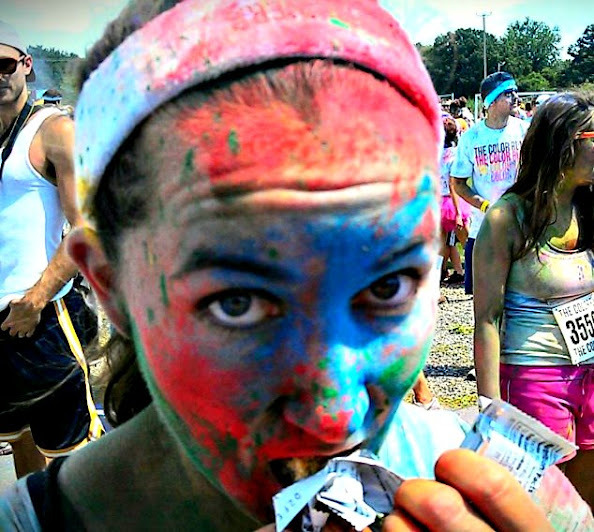 Granola bars are always a safe bet. But, back to Nicaragua and Roberto, Sr.
After leaving Volcan Masaya, Roberto drove us to the market in the city. On the way to the market, Roberto told us we were going to try something called “atole” later on. Having never heard of this and being concerned about potential ingredients, I asked what atole was. Roberto explained, but unsurprisingly, my ingredient-related vocabulary is weak (if non-existant) so all I was really able to comprehend was that it involved corn. Shameful. 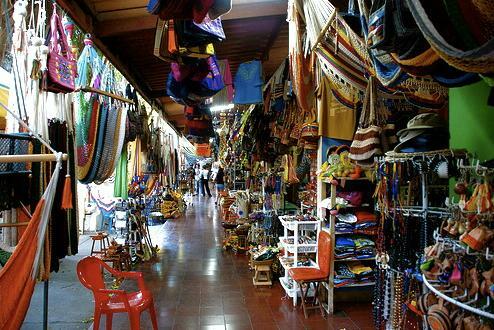 Fortunately, we had Roberto who, when we wanted to make a purchase, would handle the haggling for us. He saved me at least $30 in total by casually telling the vendors what we’d pay, instead of asking hesitantly as I have a tendency to do. At one point, Sara was trying to figure out the cost of a t-shirt. When the vendor told her it was $5usd, Roberto caught my eye over her shoulder, winked and shook his head to indicate that we could find a better price elsewhere. Our expedition to the market was entirely too successful. Once we finished up, Roberto took us to a nearby street vendor for the aforementioned atole. When we realized we were going to be eating street food, Sara and I had a mini celebration in the back seat. Earlier in the day, we had been (half) joking about using our last day in Nicaragua to go to as many street vendors as possible, eat as much of their food as we could fit into our stomachs, and then deal with the aftermath of those poor decisions while on the plane. This street vendor had two cards situated next to each other on a street corner. One cart had a pot of some kind of thick, opaque liquid while the other had little empanadas. Roberto first offered us the empanadas, which had sugar on top and something reddish-orange inside. He said it was queso, but it didn’t taste like that. They were extremely good. 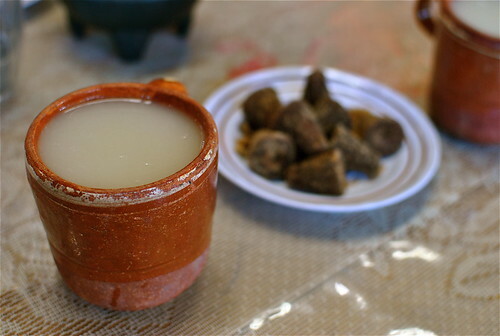 However, Roberto clarified that this was not the atole. Process of elimination indicated that the stuff in the pot was the atole. This caused me some anxiety – what was in there?! The vendor gave us bowls and spoons made from coconut shells, which was extremely awesome. She then served us the thick, white liquid and put some cinnamon on top. I know I like cinnamon. This was comforting to me. Regardless, I still felt pretty apprehensive because I had no clue what I was about to eat. The only thing I knew was that I had to try it because Roberto was so excited about it. So I did. And it was good – very sweet, creamy and warm. With the cinnamon, it was kind of like eating pureed oatmeal. We all had another empanada, finished our atole and then Roberto tried to pay for us. We nixed that quickly and said we wanted to pay for him because he’d been so awesome all day. He allowed this, but then paid for the empanadas. Sneaky. Back in the car, Roberto explained that this particular vendor made the best quality atole in the area. Apparently, atole needs to be started at 4am. It needs to be stirred all day and is literally just made up of corn and cinnamon. He promised us it was very good for the system, all natural, no chemicals or preservatives. He told us that he didn’t bring everyone for atole, only the “chicos y chicas mas bueno.” That was adorable. He said that for the “malo chicos y chicas” he drove very fast and didn’t do anything special. Furthermore, since we were over on time (we were about an hour past when we were supposed to have returned to the hostel) he was going to tell the hostel that the car broke down so we wouldn’t have to pay the extra $7/hour. As we got closer to the hostel and he learned that we were leaving the next day, he said he wanted to drive us to the airport. We were going to have to pay a taxi to get there anyway, plus he was charging a fair price and we were devastated to be leaving him, we agreed. After saying goodbye to Roberto at the hostel, Sara and I walked over to the mall in search of a music store. We found one, but pickin’s were seriously slim and none of the artists recommended to me by Roberto, Jr. or the waitress from the coffee shop were there. I did buy a salsa CD, but unfortunately it’s awful. Although it was getting darker when we left, we wanted one last meal (and not from the food court). There was a nearby restaurant called El Churrasco that we passed every time we went to and from the mall, so we decided to try it out of curiousity, even though the doors were tinted and it looked closed. I could see two waiters inside leap up from their seats as I opened the door. We were the only two customers there, even though it looked like a nice restaurant. Expensive, too, as we learned from looking at the menu. We decided to stick with appetizers (grilled plantain and cheese for her, grilled chorizo for me) and alcohol (last chance for Flor de Cana, Nicaragua’s #1 rum!). The food was excellent and although it was a little awkward being the only two people in the place, we managed to survive. I want Roberto to adopt us. Also, as one of my friends pointed out, I definitely missed the black pants, striped shirt memo. The next morning, we were up and out by 4am. Before we knew it, we were at the airport again. We had one of the security guards take a picture of us with Roberto – one last picture in Nicaragua! Checking was easy and I was able to help a Nica woman and her mother (92 years old and adorable) fill out their travel forms. I was so proud of myself for remembering what ama de casa meant, as I don’t believe I’ve heard it since vocational vocab sophomore year of college. There are more pictures that I would like to add to this post… however, Sara needs to send them to me first.